The Virginia Dept. of Motor Vehicles office on Four Mile Run Drive in South Arlington will remain open, after all, thanks to a deal facilitated by Del. Alfonso Lopez (D). We reported in November that the DMV was planning to end its lease this spring and move to the Barcroft Plaza shopping center in the Falls Church area. The planned move was not particularly well-received in Arlington nor in Fairfax County, where the new DMV office was to open. Del. Lopez organized a community meeting in Arlington to hear concerns about the plan, while residents of Fairfax County’s Mason District lambasted the plan and the anticipated traffic and parking problems the new DMV would bring. “The locals really did not like it,” Lopez noted. In a quick series of deals this month, the DMV was released from its Barcroft Plaza lease and renewed its lease at 4150 S. Four Mile Run Drive, according to Lopez. The state government will even get a reduction on its rent. The new DMV office that’s planned for Virginia Square, meanwhile, is still expected to open later this spring. The press release from Del. Lopez’s office is below. 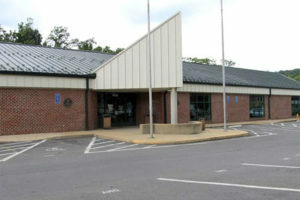 The Virginia Department of Motor Vehicles has signed a lease to keep open the Arlington Customer Service Center on Four Mile Run Drive. In addition to continuing convenient service in South Arlington, the DMV will move forward with its plans to open an additional office in the Ballston area to increase service for all Arlington residents. “I was very happy to work with Commission Holcomb and his team to ensure that DMV service remains in South Arlington. I am also pleased that DMV is adding additional service in the Ballston area of Central Arlington,” said Delegate Lopez (D-Arlington). According to the letter, the new lease includes a substantial rent reduction, money for tenant improvements, a more equitable facility maintenance structure, and a parking lot study/redesign.